Here is an invitation to celebrate Spring: let’s HIKE Lebanon MountainTrail, in Owen Sound North of Toronto, Saturday April 23rd, 2016. 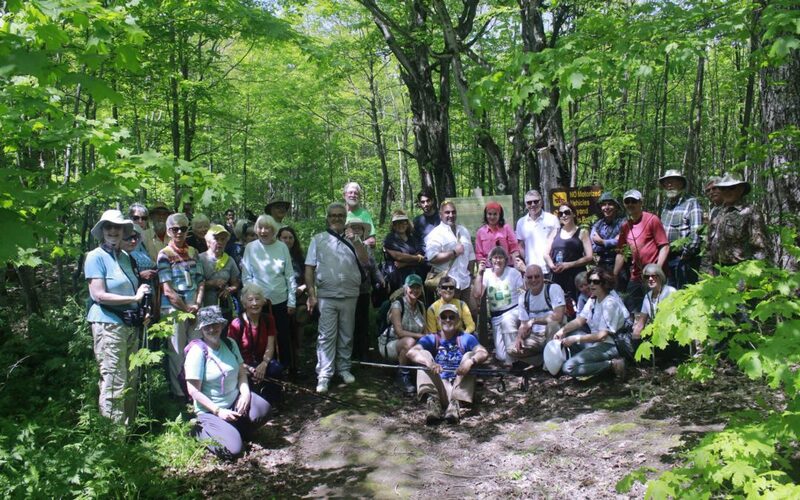 The hike will be in celebration of the friendship between Lebanon Mountain Trail and the Bruce Trail in Ontario, see links and info below. It is not only healthy, and socially responsible but mostly happy and free (bring your own snack style). The place is called the Bayview escarpment, about 1hr 40 min North West of Toronto. There is a 7 km and 12 km options (4-5 hours), it is on the Sydenham Club where we join the Bruce Trail members in the Spring hike, on the section called after Lebanon Mountain Trail. It is a medium level loop hike, a bit rocky with small hills, but amazing forest sounds and views. Plus a great company: we get to meet as a community and connect with our dear friends from Bruce Trail. We may also plan an optional cafe or restaurant get-together. We love to hear from you about your interest, and we ask you please to spread the word. Please rsvp [email protected] or feel free to call or text 647 522 6547, start your message with: LMT Spring hike, and sign with your name please. One section of Bruce Trail (close to Owen Sound town, in Ontario- Bayview Escarpment Nature Reserve) was twinned with section 5 of the Lebanon Mountain Trail (from Sir ed Danniye to Ehden). The Bruce Trail is Canada’s oldest and longest marked footpath, and is as unique as Canada itself. The 890 kilometre Bruce Trail is cared for by hundreds of dedicated volunteers and it spans terrifically varied and beautiful landscapes through Canada’s most densely populated region, from rolling hills, to spectacular vistas to rugged coastlines. The Bruce Trail provides the only continuous public access to the magnificent Niagara Escarpment, a UNESCO World Biosphere Reserve. While Canada is rich with beautiful, natural spaces and marvelous trail systems, the Bruce Trail itself is one of a kind. The Lebanon Mountain Trail (LMT) is the first long distance hiking trail in Lebanon. The 470 km path crosses more than 75 villages and towns from the North to the South of Lebanon at altitudes ranging from 600 to 2,000 meters (1,800-6,000 feet) above sea level. The trail transects one Heritage Site, three Nature Reserves, one Biosphere Reserve, and several Protected and Important Bird Areas (IBAs). It showcases the natural beauty and the cultural wealth of Lebanon’s mountains. Since 2007, the LMTAssociation is working to safeguard this heritage and to promote a socially responsible tourism. Trail development, education, conservation, and rural development are at the heart of the LMTA programs. This is a very nice hotel, overlooking the bay at Owen Sound. Their group rate would be approximately CAD $147 per room, which includes all taxes. The rooms would have one or two queen sized beds, and this would include deluxe continental breakfast, complimentary parking, and wireless internet. An alternate choice, for people not wishing to spend that much, could be the Pinecrest Motel http://www.pinecrestmotel.com/ This is more basic, but still clean and OK, their group rates for room with 1 queen bed is $73, or with 2 double beds is approximately CAD $84, taxes included.